Come discover the charms of Arkadia Eastman with a large wooded lot, Jacuzzi, sauna and massage therapy. Spa Bolton, Cristal Mine, Cuivre Mine, Magog, ski stations end golf Mont Orford, Owl's Head and many others like: Beach Magog, Croisières Escapades Memphrémagog, as well as few local vineries. You will start your day with unforgettable European breakfast, visit local attractions, relax in our Jaccuzzi or our water garden. These are just a few of the reasons you’ll want to come back! We offer a smoke-free environment. Beautiful location and wonderful homey feeling Bed and Breakfast with a kind and helpful host. As a single person travelling it was fun have someone to chat with! Moreover breakfast was plentiful and I was able to make a lunch for the road. Lots of small perks that you can't get at a hotel. Moreover, everything was so well planned with the customer needs in mind. Wonderful country getaway in the Townships near Mt. Orford. A very generous and delicious breakfast. Very friendly, helpful and solicitous hosts. 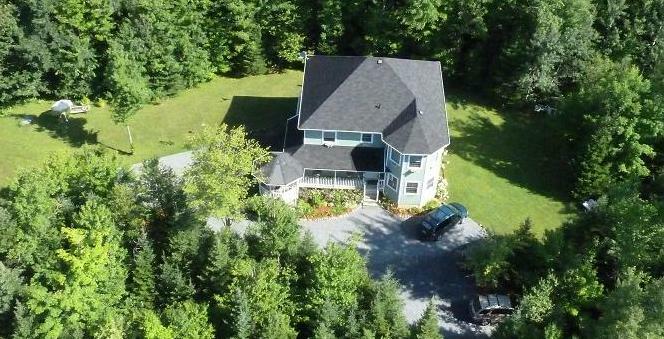 House is in a quiet, wooded location about 1km outside of Eastman where you will find a number of restaurants / pubs. It is a short 10-15 minute drive to Mt. Orford. Schönes, gepflegtes und sehr sauberes Haus mit einer sehr netten Gastgeberin, die alle Wünsche erfüllt und sich liebevoll um die Gäste kümmert. Das Frühstück ist das beste, das man weit und breit in Kanada oder den USA bekommt - Brot ,Wurst, Käse und Obstsalat. Wir haben uns nicht wie in einer Unterkunft sondern wie Zuhause gefühlt. Das absolute Highlight unserer Rundreise. Our first time in the Eastern Townships made memorable by our stay at Arkadia Eastman Arkadia Eastman is a very clean and beautifully decorated establishment. It is run by a very sweet lady who takes great care in making breakfast and keeping the property tidy. We had a great time getting to know her and relaxing in the living room, outside on the patio, and in our very comfortable room. The location for us was great. We were very close to the Orford park/beach/mountain as well as several delicious restaurants that blew our minds (Le Cote just a 10 minute walk away was amazing, as was Comme Chez Soi, about 12 minute drive away). We absolutely loved our stay here. The b&b is very comfortable and super clean with lots of little added extras that make it even better. The hosts are super welcoming and helpful, just lovely people. Breakfast was the best we had over six weeks in Eastern Canada. A wonderful place to stay. Lovely couple who ran the B&B - breakfast was absolutely delicious - so much food to choose from ! Bed was comfortable and all amenities that you could imagine were included. Gorgeous frog pond in the back with quiet nooks to read and relax - we will return! A perfect night at Arkadia!! The place is very nice and perfectly located. Staff was very friendly and helpful. We were able to appreciate a full American breakfast and more. The house is large and rooms are equipped with evrything you will need have during your stay. Great B&B and great location. Delicious breakfasts. Fantastic relax in your Jacuzzi and water garden. I wish we know this place before. See you soon again. We had wonderful time and enjoyed your hospitality. We wish you luck in keeping your business as good as it is. Wonderful hospitality - great breakfast. Merci Beaucoup. Thank you for the delicious breakfasts, the advise on restaurants + all the time you spent talking to us + teaching us to "parler français"! Merci Beaucoup pour votre hospitalité! A Bientôt! Thank u very much for your hospitality. You have a beatutiful place. Thank you very much for all your suggestions. It was fun soaking in your Jacuzzi.